A brain tumor is a pathological abnormal growth of cells in the brain. A brain tumor is a neoplasm, or abnormal growth of cells, within the brain or the spinal canal. Detection of brain tumors usually occurs in advanced stages when the presence of the tumor has caused unexplained neurological symptoms. Neurological symptoms of a brain tumor depend on size and location, but may include impaired judgment, memory loss, lack of recognition, spatial orientation disorders, personality or emotional changes, visual impairment, and more. Treatment for a brain tumor depends on the tumor type and location and may include surgery, radiotherapy, and chemotherapy. The most common primary brain tumors are gliomas, meningiomas, pituitary adenomas, and nerve sheath tumors. chemotherapy: Chemical treatment to kill or halt the replication and/or spread of cancerous cells in a patient. glioma: A tumor that arises from glial cells in the brain or spinal cord. 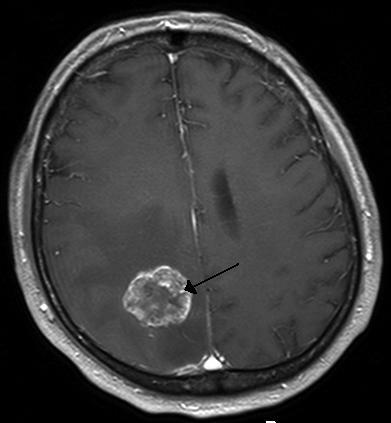 An example of a highly treatable brain tumor subtype is medulloblastoma. An example of a brain tumor subtype with a poor prognosis is glioblastoma multiforme. Other examples of brain tumor subtypes include oligodendrogliomas and astrocytomas. A brain tumor is an intracranial solid neoplasm—a tumor (defined as an abnormal growth of cells)—within the brain or the central spinal canal. Brain tumors include all tumors inside the cranium or in the central spinal canal. They are created by an abnormal and uncontrolled cell division, usually in the brain itself, but also in lymphatic tissue, blood vessels, the cranial nerves, the brain envelopes (meninges), skull, pituitary gland, or pineal gland. Within the brain itself, the involved cells may be neurons or glial cells (which include astrocytes, oligodendrocytes, and ependymal cells). Brain tumors may also spread from cancers primarily located in other organs (metastatic tumors). Metastasis in the Right Hemisphere: Brain metastasis in the right cerebral hemisphere from lung cancer shown on T1-weighted magnetic resonance imaging with intravenous contrast. Visibility of signs and symptoms of brain tumors mainly depends on two factors: tumor size (volume) and tumor location. The moment that symptoms become apparent, either to the person or people around him (symptom onset), is an important milestone in the course of the diagnosis and treatment of the tumor. The symptom onset—in the timeline of the development of the neoplasm—depends in many cases on the nature of the tumor but in many cases is also related to the change of the neoplasm from “benign” (i.e., slow-growing/late symptom onset) to more malignant (fast growing/early symptom onset). Consequences of intracranial hypertension: Large tumors or tumors with extensive perifocal swelling (edema) inevitably lead to elevated intracranial pressure (intracranial hypertension), which translates clinically into headaches, vomiting (sometimes without nausea), altered state of consciousness (somnolence, coma), dilation of the pupil on the side of the lesion (anisocoria), papilledema (prominent optic disc at the funduscopic eye examination). Dysfunction: Depending on the tumor location and the damage it may have caused to surrounding brain structures, either through compression or infiltration, any type of focal neurologic symptoms may occur, such as cognitive and behavioral impairment, personality changes, ataxia, visual field impairment, impaired sense of smell, impaired hearing, double vision, dizziness; more severe symptoms might occur, such as including partial paralysis or impairment to swallow. Irritation: abnormal fatigue, weariness, absences, tremors, and epileptic seizures. A variety of experimental therapies are available through clinical trials. Survival rates in primary brain tumors depend on the type of tumor, age, functional status of the patient, the extent of surgical tumor removal, and other factors specific to each case.